The internet exploded earlier this year with outrage from Western vegans, animal lovers, and dog owners in response to the Lychee and Dog Meat Festival held in Yulin, China. 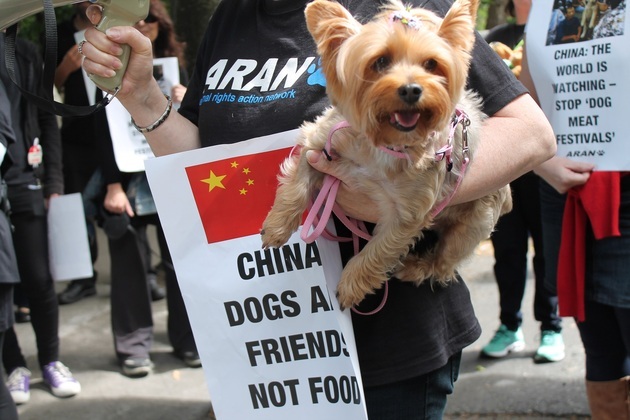 Graphic images inflamed sensibilities and a conflict began to mount that was clearly producing racial tension between the (typically) white animal rights protestors and the people of China who practice a cultural tradition of eating dog meat. Defensive over claims of cruelty on one side and racism on the other, each group backed into their respective corners. This pattern of cross-cultural conflict is seen regularly within the animal rights movement and the charges of racism and imperialism are often well-founded. On this show we talk to Dr. Claire Jean Kim about these cross-cultural conflicts. Dr. Kim is a Professor of Political Science and Asian Studies at University of California, where she teaches classes on comparative race studies, social movements, and human-animal studies. Her book, Dangerous Crossings: Race, Species, and Nature in a Multicultural Age, examines the intersection of race, species, and nature in impassioned disputes over how immigrants of color, racialized minorities, and Native people in the U.S. use animals in their cultural traditions. The main focus of the book explores a campaign to ban live animal markets in San Fransisco and examines the racial tension that resulted between the mainly white protestors and the merchants of Chinatown. The second and third case studies cover the controversy surrounding a decision by the indigenous Makah nation to resume whaling and the outrage over the arrest and conviction of Micheal Vick on charges of dog fighting. This interview covers the concepts from Dr. Kim’s book, as well, we will apply the theories and lessons learned from Dr. Kim’s book to the recent example of the Yulin Festival and talk about ways in which issues of animal suffering can be addressed cross-culturally without reproducing oppressive racial and imperial patterns.